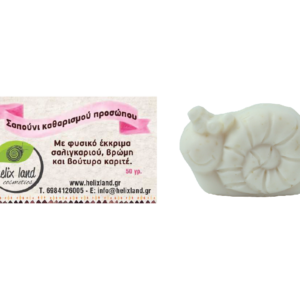 With natural snail extract, Collagen, vitamin A and C, and lemon essential oil. The skin renews faster at night so the night cream enhances the work of the cells’ renewal where the active ingredients of those hours are absorbed more easily. The composition of the night cream includes active substances that serve the function of skin renewal at night. The addition of vitamin A is important because its stimulates the production of elastin and collagen. Moreover it smooths and reduces the appearance of fine lines, delays skin aging, reduces sebum production, fights acne and gives a clean and uniform colour tone to the skin. The addition of natural Vitamin C extract brightens and lightens the skin. Furthermore, it activates collagen synthesis and hyaluronic acid, reduces sebum production, reduces dyschromia and fights acne, improves skin elasticity and provides strong antioxidant protection. 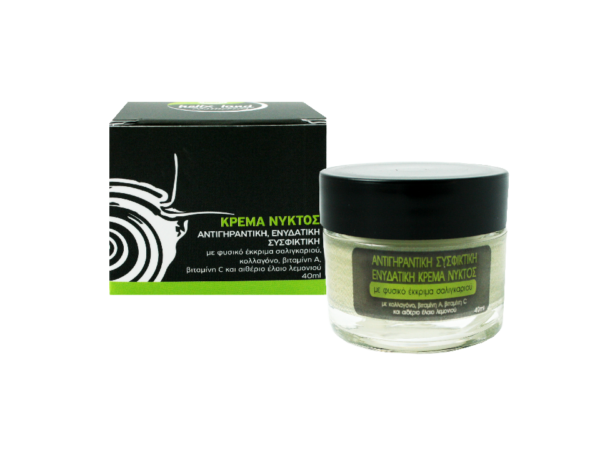 The natural snail extract of the cream offers excellent moisturization and lightens the skin. Renews, heals and regenerates thanks to its unique composition. The marine origin collagen tightens moisturizing the skin thus slowing its aging. The essential oil of lemon: removes dead skin cells and revitalizes the faded skin. Acting against oiliness and acne and is anticeptic. The night cream due to its composition is also recommended for action against acne!